One of Bovis Homes' new Cheshire developments passed with flying colours when it underwent a demanding environmental inspection recently - by the pupils from a nearby primary school. 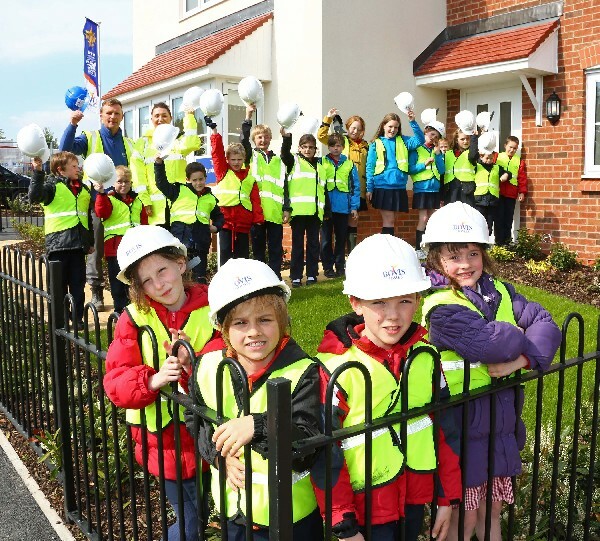 The children from Cuddington Primary School are neighbours of the housebuilder's new Forest Edge development in the town and have been watching on with interest for the last few months as the new community has taken shape. A group of enthusiastic young ecologists and teachers have now paid a visit to Forest Edge to see the work close-up and were particularly interested to know how the building of homes impacts on the environment and what the builder can do to promote sustainability. "The whole school community has been fascinated watching the buildings going up behind the school and watching the effect of the building on the site," said head teacher Yvonne Elliott. "We have been particularly intrigued by the huge mound of earth that has risen up behind our field which has had enormous diggers and dumper trucks climbing it and we were thrilled to watch the mighty crane which came to lift the roof on the house adjoining our grounds." The children were all members of the 'Eco Committee' which meets every two weeks to discuss the school's environmental performance and come up with ideas as to how it could improve. "We were very lucky to be welcomed by the Bovis Homes site manager, landscape architect and several of their colleagues, who made us feel very welcome and were very accommodating. One of the children took notes as the questions were answered so we came back much wiser!" Those questions covered areas such as the wildlife at the development, the energysaving features of the homes, what recycling was done on-site and the different phases of the housebuilding process. "We were thrilled to learn that there were two badger sets on the land and that bat boxes were going to be put in some of the houses," said Mrs Elliott. "However, the real highlight was coming back to school with a hard hat each that they were allowed to keep and a packet full of goodies each including a colouring book, pencils, balloons and chocolate!" Louise Polverino-Coulson, Area Sales Manager from Bovis Homes, said: "We were delighted to host the school and help them out with their studies. The children asked some excellent questions and we were able to show how important environmental factors are when it comes to building a new neighbourhood such as the one that is taking shape at Forest Edge."